M48 Tactical Shovel Entrenchment Tool with Axe Blade And Sheath | BUDK.com - Knives & Swords At The Lowest Prices! 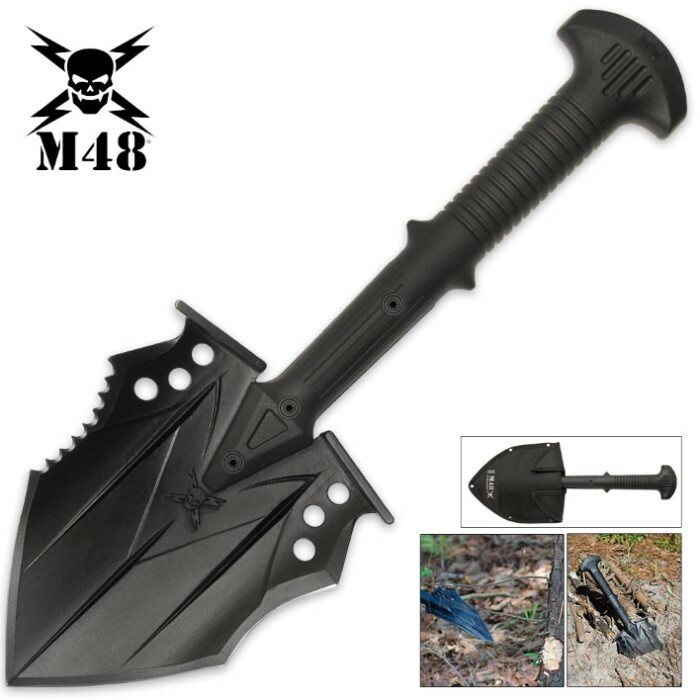 Multifunctional field tool is so much more than mere "shovel"
M48 is proud to offer the ultimate tactical shovel - a multitalented field tool that cuts, chops, saws, digs and even fends off attackers! Built to withstand vigorous use in punishing conditions, it features a 2Cr13 stainless steel head - tempered for strength and flexibility and black oxide coated for exceptional corrosion resistance. Each edge is uniquely shaped and sharpened for maximum cutting versatility; concave beveling on one side yields potent chopping power, while serrations on the opposite edge make quick work of sawing jobs. The edges converge to a form a bitter, penetrating point. 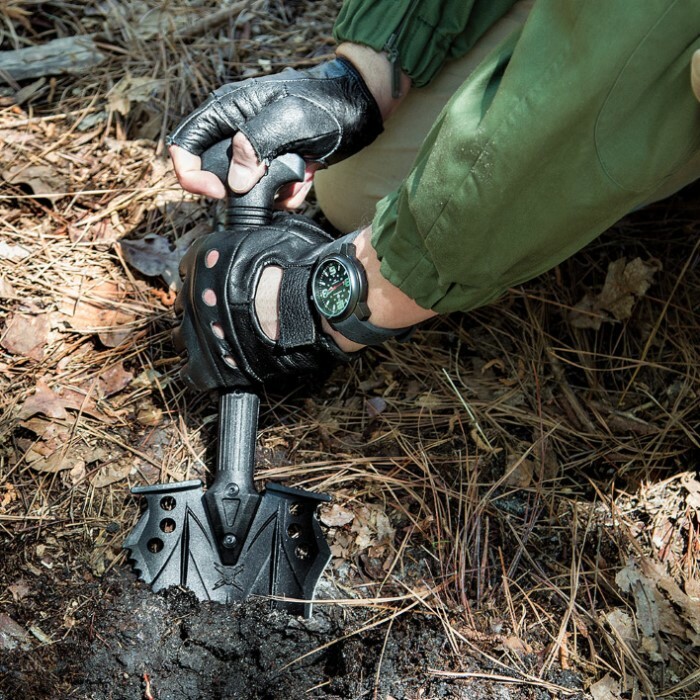 Like the head, the Tactical Shovel's handle is virtually indestructible, made of advanced glass-fiber-reinforced nylon. Perfect for camping and other outdoor activities, light chopping or even emergency self-defense! As a shovel, this is a fine specimen. Its sharp point easily cuts through dirt and the serration tears up tough roots, a problem I have dealt with many a time. It is very sturdy and I would not doubt it has very good potential as a self defense tool. My only complaint is the small protrusions in the middle of the handle make it impossible to choke up on the handle without letting go. Other than that, I am very happy to own this fine product and my compliments go to United Cutlery for its creation. For the money, this is a great tool to have in your collection. It's built solid, but still light weight enough for backpacking. This is a shovel, an ax, a saw, and, best of all, a pretty formidable weapon for close quarters hand to hand, or fending off pesky predators. All this for only $40 makes it my best buy. this thing is very cool but very small as well.. This is a great product like many that I have received from BudK. I have beat the crap out of this thing against trees and dug surprisingly deep holes in a matter of minutes. 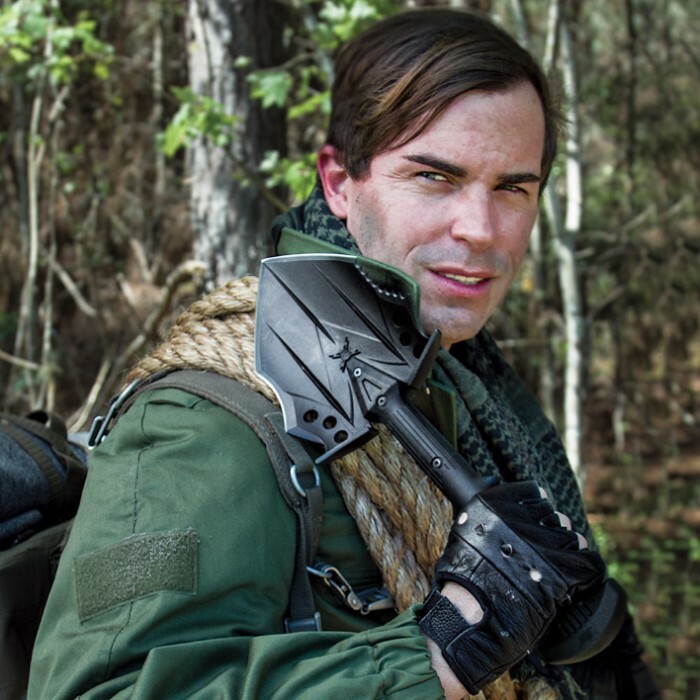 This shovel is amazing and I strapped right next to my M48 Tomahawk on my Tactical Bug Out bag. One of the best purchases I have made for my Bug Out Bag, hands down! The only way to describe this shovel would be BAD A$$. The compact size is perfect and it seems like it is very durable and could handle a lot. Holy crap this shovel is awesome all though the handle could be a little longer bud other than that its cool but my sister is afraid of it(not a bad thing). The head is smaller then i thought but it looks mean and came sharp love it. You can kill critters with it and you can bury critters with it!